The Chase Freedom Unlimited currently has an Informr score of 8.6 out of 10. This score is based on our evaluation of 35 sources including reviews from users and the web's most trusted critics. Chase Freedom Unlimited is typically available to those with good credit scores (650 or greater). Freedom Unlimited’s flat, unlimited 1.5% earning rate on all purchases isn’t the most generous cash back deal on the planet, but it’s much easier to manage. And that’s welcome news for busy cardholders who don’t want to think twice about which card to use in any given circumstance. If you are looking for a simple cash back card, and don’t want to keep track of rotating categories, the Chase Freedom Unlimited Card may be just what you need. But if you like the excitement of a quarterly bonus rewards program, are a frequent traveler, or regularly make use of cash advances, you might want to check out some of our partner’s other cards. With no minimum redemptions and plenty of options for cashing in on rewards, it offers more flexibility than we’ve seen in other Chase cards. It doesn't come with the highest ongoing flat-rate cash-back rate, but it starts out with quite a bang. For consumers looking for a card that offers versatility and value, this one is a strong choice. 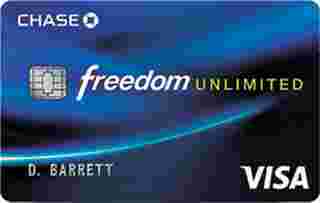 The Chase Freedom Unlimited is a great card if you pair it with another Chase card that earns Ultimate Rewards points. On its own, its 1.5% cash back is solid, but not the best on the market. But if you like banking with Chase, and you pair the Chase Freedom Unlimited with a premium card, you’ll have a winning combination. The Chase Freedom Unlimited offers a 15-month intro APR period, which is at the longer end of the cards we analyzed. This gives you ample time to pay off a big purchase. But unlike some cards with lengthy promotional periods, the Freedom Unlimited is no throwaway card: It charges no annual fee and has a decent rewards rate (unlimited 1.5 points on all purchases), making this a card you may want to keep in your wallet even after the 0% intro period expires. The Chase Freedom Unlimited is a balanced alternative to its sibling, the Chase Freedom. It’s also great complement to the Chase Sapphire cards and Chase Ink Business Preferred card. If you are looking for just one card or for cash back, the Freedom Unlimited is not the best option. But as part of a wallet with multiple Chase cards, it’s fantastic. As with any decision to get a credit card, you’ll want to consider both the welcome bonus and the long-term benefits of the Freedom Unlimited. For me, I get more than enough use out of it to make it a staple in my wallet — have to earn those Ultimate Rewards points! Others may find that the Chase Freedom’s quarterly 5X categories are more than enough to take care of their needs and that’s totally understandable. Overall, this is a compelling cash-back credit card for anyone looking to earn with a simple, easy-to-understand rewards program and no annual fee. While it is not the very best awards rate out there, it does come with some valuable benefits that competing cash-back cards don't offer. One card to rule them all is the name of the game here. This offer includes unlimited 1.5% cash back, plus other valuable perks and fee-friendly features that make it a solid contender if you're wanting to maintain a one card wallet.